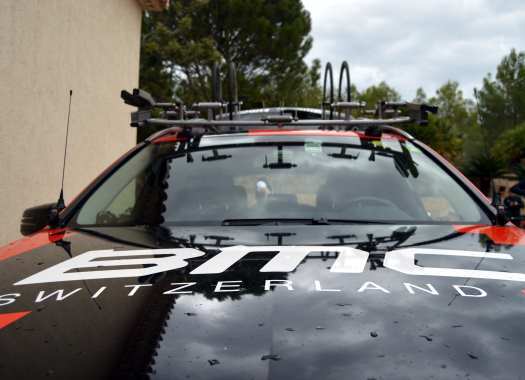 Alessandro De Marchi (BMC) has won the 11th stage of the Vuelta a España. The Italian was part of the breakaway and after a late attack, crossed the finish line on his own. The longest stage of the 2018 edition of the Spanish grand tour took the riders through a 207.8-kilometre long route between Moumbey and Ribeira Sacra over a hilly profile and on a dark and foggy day that contrasted with the heat and the sun of the previous days. The start of the day was fast and full of attacks of riders like Vincenzo Nibali, Fabio Felline, Dylan Teuns, Lukas Postlberger and Thomas De Gendt, among others, but the peloton managed to repel them all. Meanwhile, Astana's Miguel Angel Lopez had a mechanical and the speed of the peloton left him struggling behind. Nacer Bouhanni (Cofidis), Georg Preidler (Groupama-FDJ) and Alexis Gougeard (AG2R La Mondiale) gave up on the race on the first kilometres of the stage. At around 75 kilometres to go, a large group of 19 riders managed to break free. Thibaut Pinot (Groupama-FDJ) was the best-positioned rider of the escape group and he had the company of riders like Bauke Mollema (Trek-Segafredo), Nicolas Roche, Dylan Teuns (BMC), Tiesj Benoot (Lotto Soudal) and Pierre Rolland (EF Education First). With 65 kilometres to go, Pinot attacked from the front and Teuns followed his wheel. Later on, they were joined by Mollema and Ryan Gibbons (Dimension Data). A few kilometres later, Mollema attacked and created a gap with the rest but soon was rejoined by Pinot, Alessandro De Marchi (BMC), Rafal Majka (Bora-hansgrohe), Jack Haig (Mitchelton-Scott), Sergio Henao (Sky) and Jhonatan Restrepo (Katusha Alpecin). At 20 kilometres from the end, De Marchi and Restrepo made a move and kept going by themselves with the rest of the escapees chasing them in several groups. With four kilometres to go, De Marchi attacked and left the Colombian behind. At the same time, EF Education First increased the pace at the last climb of the day and managed to break the pack. The favourites managed to stay in the group but most of them were left without helpers. De Marchi arrived to the finish line on his own and took his third victory in the Vuelta a España, after he also did it in 2014 and 2015. Restrepo crossed the finish line at 27 seconds from the Italian. The favourites arrived together to the end of the stage and Simon Yates (Mitchelton-Scott) managed to keep the Red Jersey.